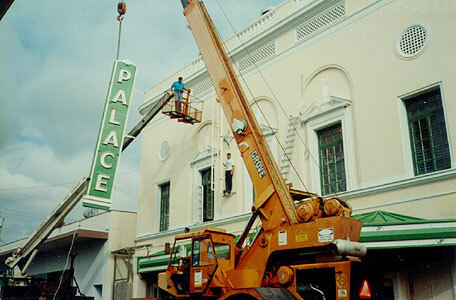 The Palace was built and opened in 1925 at the peak of the heyday for American movie palaces. It was originally part of a small family of theaters owned and operated by Adam C. Baker, a dashing Hawaiian gentleman who was the nephew of the last royal governors of the island of Hawai’i. 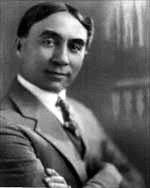 Adam Baker had been involved in the theater business since the early 1900s and was a well-known showman in Hawai’i. Left: ADAM CHARLES BAKER – Photo from the collection of Robert Alder courtesy of George Baker. 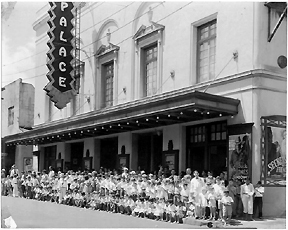 The Palace was built on a scale that had never been seen outside of the capital city of Honolulu, and it was always the grandest theater on all the neighbor islands. One unusual feature was that the Palace’s structure was entirely of redwood, imported from the Pacific Northwest. Fourteen huge redwood columns supported the wooden roof trusses which span the entire width of the building. The roof, sides and back were sheathed in corrugated sheet metal, a very typical construction style in tropical Hawaii. The building’s façade is an elegant neo-classical design executed in stucco with wood molding accents. 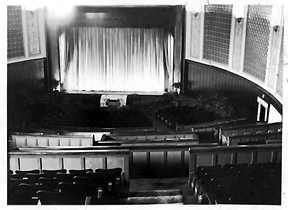 The photo is of the auditorium in the early 1930s. The Palace was designed to take maximum advantage of its limited property size. 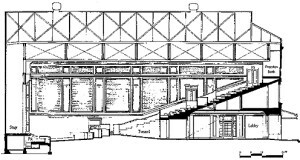 The stadium seating arrangement (pre-dating the “discovery” of stadium seating by modern theater operators in the 1990’s) allowed for unobstructed sight lines, while giving the Palace a very spacious lobby. Designed and built in the days before electronic sound amplification systems, the Palace boasts excellent natural acoustics for live musical groups and drama. One of the most enchanting, nostalgic, and thrilling experiences is the music of the original Robert-Morton pipe organ in concert or before a movie presentation. In 1930, The Palace Theater was sold to Consolidated Amusements, Ltd which began showing first run movies. In 1940, the Palace pipe organ and Johnny DeMello moved to the ten Hilo Theater. See the page about the Pipe Organ here. Consolidated Amusements, Ltd then began to use the Palace Theater solely for the storage of the highly flammable film in a vault that is still in existence in the office. Many upgrades including structural considerations were taken on by this hard working group of business and community volunteers. 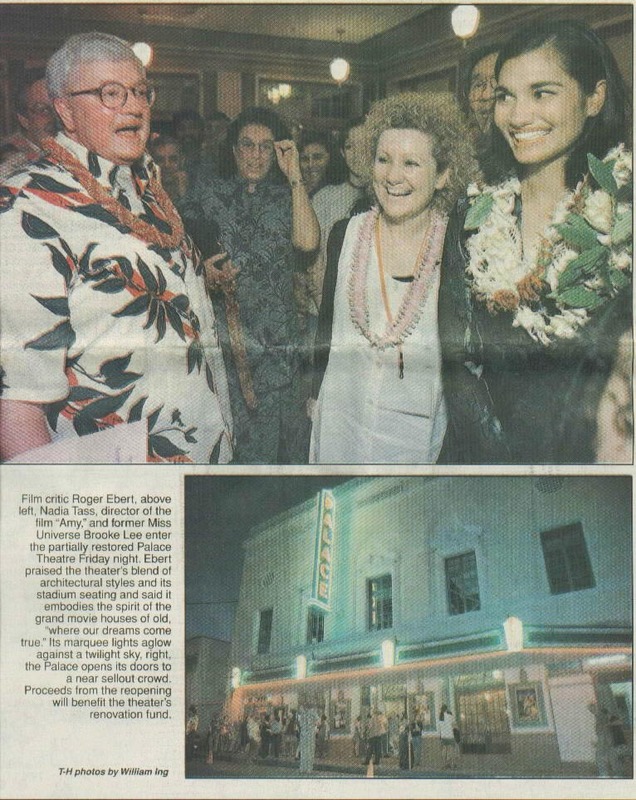 For a grand opening event, the newly updated Palace Theater hosted a Hilo version of the Hawaii International Film Festival, complete with a visit from Roger Ebert. Robert L. Alder – for his dedication and perseverance on behalf of the Palace Theater and for loaning us historical photos and information. We are always looking for old photographs or memorabilia to post here. If you have something you’d like to share (or know someone who does), please let us know. We can arrange to take photos of your memorabilia or scan old photos, programs or posters and return them to you immediately. Mahalo!